ROME, Nov 26 2018 (IPS) - The new government in Pakistan has now been in office for over 100 days and has started work on its reform and socio-economic agenda. There is a growing realization that being in government is far more difficult than it first appeared, and that in order to move forward there is an urgent need to build national and international partnerships. Of the challenges facing the country, food insecurity and malnutrition are high on government’s priority as was evident from the Prime Minister’s inaugural speech. The focus on food security and nutrition is warranted. Nearly half of children under the age of five in the country are suffering from stunted growth, which implies that they will most likely not reach their full physical and mental potential. In addition, approximately 60 percent of the population is vulnerable to food insecurity. Past governments and donor agencies have been making strong efforts to address food insecurity and malnutrition. The United Nations’ agencies, in particular the World Food Programme, has been working on the malnutrition problem by providing supplements to children, pregnant and lactating women, in addition to leading a wheat and oil fortification programme. The government, on the other hand, has focused on augmenting incomes of the poorest households and providing affordable flour and bread. The Benazir Income Support Programme provides cash support to poor families with the aim of meeting basic needs; the Sasti Roti programme provided inexpensive bread to urban dwellers; and the government continues a long standing subsidy, albeit a rather inefficient one, to flour mills to supply affordable wheat flour to the public – a programme that could be replaced by allowing imports of cheaper foreign wheat. However, given the scale of the food insecurity and malnutrition problem in the country, government and donor assisted schemes will not be sufficient and there is a need to look for innovative and low cost mechanisms that would strengthen partnerships with private initiatives. One such partnership could be with the Sufi shrines in Pakistan. The sufi shrines, which are scattered around the country, feed large numbers of people on a regular basis. One of the largest and most important of these shrines of that of Lal Shabaz Qalandar in the province of Sindh – not far from Karachi, the country’s main port, financial center and largest city – where hundreds of thousands of pilgrims visit every year. 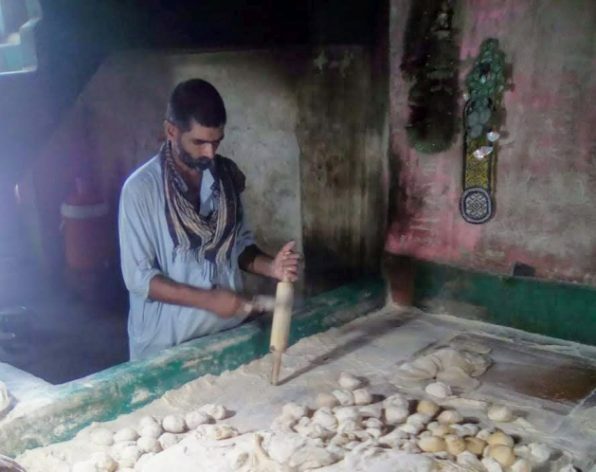 At Sehwan Sharif, there are a number of charity-funded kitchens where food is prepared for free distribution. At one of the bigger kitchens, about 1,600 kgs of flour is baked into bread every day – enough to feed 5,000 people. Charitable activities are an integral part of Pakistani culture and take many forms. For example, ordinary families routinely pay for food, as well as school fees and medical expenses for employees, helpers and poorer relatives. Many hotels and restaurants will distribute leftover food to the poor; a number of industrial units, more commonly the larger and more organized ones, will provide a free lunch to their workers; and successful business houses will set up charitable foundations. The amount of help provided increases during times of national emergency and crisis. After the 2005 earthquake which killed over 80,000 people and the floods in 2010 which caused damages of around US$10 billion, a large part of the relief effort was taken on by ordinary citizens on an individual or collective basis. They provided money, clothing, food and medicines while skilled professionals such as doctor and engineers travelled to affected areas to help. Inter country studies confirm the importance of charity in Pakistan. In a review done by the Charities Aid Foundation (the World Giving Index 2017) with the help of Gallup, Pakistan stands 78 out of 137 countries in the global ranking of countries by how much they give to charity. While this is a respectable ranking, a more detailed look at the statistics shows that some 41 million Pakistanis donated money for charity (5th largest number among all countries) and 61 million helped a person they did not know directly (7th largest number in the world). Hygiene and food safety. The nutritional benefits of the food provided are severely diminished due to contamination by bacteria and parasites at all stages of storage, preparation and serving. The cloths used to cover the food are often filthy; plates and other utensils are poorly washed; there are a large number of flies and other insects that deposit contamination; and often rats, mice and cockroaches infest the areas where food is stored. Simple training and awareness-raising are low cost methods to address this. Local officials, or university or high school students, should be drawn upon to help. Food Fortification. In Pakistan various micronutrient deficiencies are highly prevalent and cause problems such as anemia, especially among women. Fortifying wheat and other foods served at the shrines is a very low cost way to raise levels of nutrition. Additives could be provided through local public health staff or by involving local doctors and pharmacies. As in the case of food, better government guidance and oversight would considerably improve the impact of private initiatives in many other areas. For example, following natural disasters, providing guidelines on what is needed by impacted populations would improve effectiveness; providing psychiatrists and psychologists to charitable institutions providing homes to the mentally ill or to orphans; and helping build providing specialized teacher training to working with handicapped children. The Government has access to top quality expertise and international best practices – it should use to leverage the work of others rather than trying to do much itself.